The Annual wouldn’t exist if it weren’t for crowdfunding, so we aim to boost up other comedic projects whenever possible. The American Bystander is a new humor magazine that came to publication following a successful Kickstarter campaign last November. They’re just about finished with the second issue and need your help to bring it to print. Last week we spoke to Michael Gerber, a founder and publisher of The American Bystander. In your publisher’s letter from Issue 1 of The American Bystander you wrote “It isn’t even really a magazine. This is willfully re-launching the Titanic, knowing full well it will sink…” Do you still feel this way going into issue two? Well, it’s funny because people have asked about that. I was partly trying to play against type because those letters are like the statement of principles in Citizen Kane. A guy sits down and scrawls the way that they’re going to change the world, and I really felt like that was not the right mindset to be going into this with. The first thing that you should know about me is that I’ve been trying to do a magazine like this since I was 22 years old and I’m 46 now. I’ve seen them come and go and I know a lot about how The [National] Lampoon worked. Maybe five years ago, I heard from a friend of a friend that Rob Hoffman, one of the three people who founded The National Lampoon, was very ill and was probably going to die. So I called him up out of the blue, he didn’t know me from anybody, and I called him up and said “Mr. Hoffman, I just want to thank you because nobody knows that you were the person who put together the money, put together the deal, worked with Matty [Simmons] to get it all set up so Henry [Beard] and Doug [Kenney] could do their work. Nobody knows how important you were” The difference between The Lampoon and every other humor magazine before and since has been someone like Rob Hoffman at the front. I’m no Rob Hoffman but I guess I wanted to say in that letter that we want this to turn into whatever our readers want it to turn into. If that means that it’s a grand success and has a lot of money to spend and heralds in a new golden age of this material, great! If it turns out to be just one issue or two issues, that’s okay, too. Because we’re really just following what the audience seems to want. The typical way that people do this is they come up with a business plan and a way of repeating what the Lampoon guys did, which is pump it up into something huge and sell out after five years or whatever, and walk away never having to work again. That’s a very contemporary way of looking at things; “I’m going to start a humor magazine so I can get rich.” That’s not how Punch was started; that’s not how Mad Magazine was started. For anything that lasts over a decade you have to have a different kind of attitude. So I was poking fun at that vain, glorious situation. But I was also trying to check myself to sort of say “the point of this isn’t in five years to have The American Bystander’s version of Animal House. The point is to follow our staffers and say what do you want to do? What’s interesting and challenging? What does the world need? Not what can we sell for a big pay day.” We know what that is and we know it’s what already exists out there. It’s the lowest common-denominator stuff. By saying that, I want to say to us on a managing side and to the contributors: Look, we don’t expect to walk away millionaires from this. We expect to make beautiful stuff and that’s what we expect from you. And that’s what we expect from our readers too. We want them to enjoy it on that level, not be perceived as something we’re selling to advertisers. Their attention and their eyeballs. That’s very different than a corporate magazine or a corporate website, and I want to start out with that idea. Over the past two months, we have been working to turn the play into a short film, one which promises to be a 25 minute spectacle turning Christmas into Krimby. We’ll be teaming with Stephen Sues and Annual artist David Luna to animate portions the tales themselves. Familiar faces from The Last Hurrah will join us on screen to bring the story to life but we need your help to make this the best possible Krimby Film ever made! On Sunday night (in lieu of The Last Hurrah) we began production on Krimby Tales, occupying the Curious Iguana (an independent bookstore in Frederick) to shoot the film’s first scene. We’re actively working to bring this tale to life but the bulk of the film will eventually be animated and that’s where we need your help! Give the project a look on Kickstarter and please consider making a donation to the cause. There are plenty of Krimby Awards for your perusal. Click Here to Support Krimby Tales! There are about 5 hours remaining on the Mystery Science Theater 3000 Kickstarter and if you’re one of the few who haven’t taken the time to donate I highly suggest you do. Before I developed the ability to form concrete memories, my dad and I would watch MST3K, more accurately, my dad would watch it and I would babble on the floor, probably stacking blocks or whatever fad was big at the time. Once middle school rolled around the SciFi Channel (currently known as Syfy for some reason) was airing reruns on Saturday mornings. I immediately recognized Tom Servo and Crow, my underdeveloped baby-mind had managed to store away the robots from the interstitial scenes, though the movies were lost on me. At this point in life I simultaneously hit puberty and graduated from Saturday morning cartoons to Saturday morning movie riffing. Every week I was out of bed and in front of the TV by ten, sometimes getting up early enough catch the tail end of whatever work-out infomercial had bought time on the station. I read about how to build the robot puppets on the mst3k website, I dreamed about writing in to join the MST3K fan club as advertised in a graphic that often popped up in the corner of episodes. I assumed this now led an empty P.O. Box with a new owner because I understood the concept of reruns. This story lacks a real ending, like any cheesy movie, it just drags on until Scifi stops airing the show. Tonight, the #BringBackMST3K Kickstarter campaign comes to a close and will likely reach their goal to fully fund 12 episodes and a Christmas special. This website wouldn’t exist without kickstarter so as always, I encourage you to go donate and help bring MST3K to a new generation of weird kids. You can donate by clicking here and then at 5pm PST there will be a live Telethon from the Nerdmelt Theatre to wrap up the campaign, so why not make an evening of it? You may know comedian and author Sara Benincasa from her stand-up tour, “Agorafabulous,” or her hilarious, honest memoir of the same name. She’s interviewed Donald Glover and Margaret Cho in a bathtub, written countless humor articles and advice columns, and runs Happy Nice Time People, a website devoted to humor, pop culture and current events. This spring, she published Great, a modern-day, Hamptons-set, gender-bending retelling of the F. Scott Fitzgerald classic The Great Gatsby. She is an advocate for mental health wellness and the LGBTQ community. She also came out to her dad on Father’s Day (she forgot it was Father’s Day). Right now, Sara needs your help. She’s SO CLOSE to meeting her Kickstarter goal for “This Tour is So Gay,” a comedy-storytelling-service tour dedicated to reaching LGBTQ youth. She only has five days left. Read more about the tour in Sara’s own words, check out her Kickstarter, and donate anything you can. 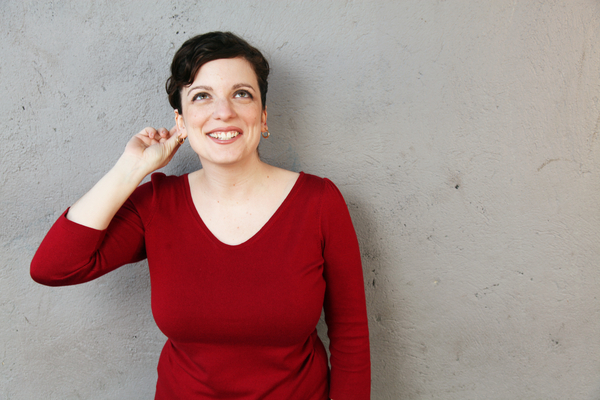 Sara Benincasa: I’m so excited about the Kickstarter. It’s called “This Tour is So Gay,” and the idea is that I would go on a comedy, book and service tour. So, in each city I visit, I’ll tell funny stories, I’ll sign some books, and I’ll do some community service for a local group that helps LGBTQ kids—hence, this tour is so gay. It’s just a fun way for me to travel around the US and Canada and tell stories and also do some good. I won’t make a profit off it—it’s 15 cities, 15 grand. When you factor in the fact that Kickstarter gets a percentage, Amazon gets a percentage, and you have to fulfill the rewards, which cost money, too, it’s not actually as crazy high an amount as I felt when I first set that goal. The Annual: Can you think of specific instances when you were growing up when something like this would’ve been important or would’ve helped you in some way—some sort of storytelling slash advocacy group? SB: Oh, yeah. When I was in high school, I used to gravitate towards the adults who just seemed cool and open. I’d like to be one of those adults for a young person today, for lots of young people. I get lots of letters and emails about things to do with mental health and LGBTQ issues. Some of the stuff that kids tell you is just heartbreaking, and I thought it would be pretty cool to try and help in some fashion—and combine it with being on stage. TA: Do you have specific stories in mind that you’re ready to tell or are you going to come up with those on the road? Or is that something you’re not even thinking about [yet]? SB: I have so many stories that I could tell—I’ve been practicing storytelling for a while now at different shows around L.A. and before that, in New York to an extent—so I think what I’m going to do is I’m going to feel it out in each city. We call it taking the temperature of the room. So I’ll take the temperature of the room and look around and see, “Does this seem like an audience that’s really engaged and wants a longer story? Does this seem like an audience in which a very sexual story would go over well, or would that be inappropriate with this audience?” I’ll figure it out as I go along. TA: Is there a city that you’re super stoked about visiting? I know you have to love all the children equally, but secretly is there one? SB: I have to love all of my babies equally! I’m really excited about Toronto because I have family in Toronto and I haven’t been there in a while. I’m really excited about Vancouver because I’ve never been to Vancouver. I’m stoked to see my friends in Denver; I’ve never been to Denver. There are cities on the tour that I’ve been to before—Los Angeles, San Francisco, New York, D.C., et cetera—but I’m excited about the ones I’ve never been to, like Seattle. I’m doing Bumbershoot—I’m doing a show called “Literary Death Match” at Bumbershoot where authors compete for prizes. So I’m trying to set up a “This Tour is So Gay” date at a bookshop or a little theater while I’m there. I’m psyched for that. I’m really excited for that. Be sure to check out our full interview with Sara Benincasa in the next issue of The Annual, where she talks about her tips for creative success, her upcoming pilot for USA, her crazy schedule and Sitting Atop A Pile Of Your Money (unrelated to her current Kickstarter, we promise). And take a look at This Tour is So Gay, because it’s perfect. Crowdfunded Comedy is a new feature that aims to highlight humor based projects on sites like Kickstarter and Indiegogo. The Annual would not exist if it weren’t for strangers on the internet who believed in us enough to make a pledge, now we’re sharing the comedic projects that we believe in. Support the Annual and receive humor every bimonth for only $20 a year!